Sometimes a concept comes to reality and that reality creates something special. That’s what happened when we designed the new Rapala RipStop. Probably the best way to describe it is to say it’s a finesse jerkbait with a special tail that makes a world of difference in how it performs and in what the bass sees when it’s in the water. It’s new so it won’t be available for a few weeks but when it is I’d strongly suggest you put a couple of them in your tackle box. They’re 3.5-inches long and weigh 1/4-ounce. The initial offering will be available in 14 colors. All that’s well and good, of course, but what really makes the RipStop special is its tail. The RipStop performs best on spinning tackle. I fish mine on a 7 foot, 6 inch medium Abu Garcia rod with a No. 30 size Abu Garcia spinning reel. My line choice is 6 or 8-pound-test Berkley Trilene 100% Fluorocarbon. Sometimes that’s all I use. At other times, though, I use braid backing and a fluorocarbon leader. I really don’t think how you spool your reel makes much difference. The biggest thing is that you use the lightest fluorocarbon you can get away with. 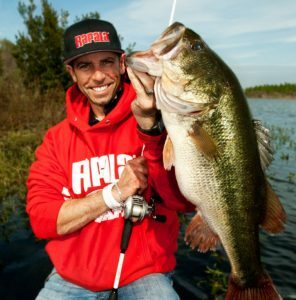 You’ll get better performance out of the bait that way and, as a result, you’ll catch more bass. This bait is the real deal when the water’s clear, the fish are hesitant or whenever there’s a lot of fishing pressure. I fish it about like I fish any other jerkbait — change up your pulls and jerks and vary your pauses until you find what they want. This is not a simple or cosmetic upgrade to an already existing jerkbait. It’s new, and it’s good. Give the RipStop a try. You won’t be sorry. Subscribe to Mike’s YouTube channel, Going Ike, to ensure you see every video.